Leadership does not always spring to mind as a key element of the learning environment of a school. It should. What is the Center for Teaching Quality (CTQ)? What do school principals do? How much should schools spend on administration? Why is it hard to recruit principals in California? What make a principal good? How can our school hire a good principal? How long do principals stay at one school? The Center for Teaching Quality (CTQ) has researched the impact of various “teaching and learning conditions” on student learning. The conditions researched include: facilities and resources, professional development, and school leadership. According to the CTQ research, no other variable on this list has as powerful an effect on student learning as the school leader. Parents and teachers are the most immediate influencers of student learning results, but a great school leader can bring out the best in teachers and foster a great environment for learning. A poor leader, on the other hand, can destroy a school. Leadership matters. This is very bad news for California, because it is uncommonly difficult to recruit principals in this state. Under the best of circumstances, principals have a difficult job. In a mid-sized school of 600 students, a principal oversees some thirty educators and a similar number of other staff, but also bears responsibility for the school's relationship with school district, parents, foundations, politicians, police, cranky neighbors, community leaders and leaders in other schools. The principal is also responsible for the school facilities, working with the district to provide for upkeep and remodeling when needed. All while conveying a loving openness and unflappable capacity to calm folks down when things aren't going the way they want. In California, the circumstances for principals are far from ideal. For example, California ranks well below other states in the number of students per administrator. (See chart below.) These administrators, in turn, oversee teachers with some of America's largest classes. It is uncommonly difficult to recruit principals in California. What does it mean to have fewer administrators in a school? As a practical matter, principals in California must do their job with one fewer leader in the office to help. The school district cannot fill the gap, either — districts in California have about half as many administrators as is typical in other states. To top it off, California’s relatively high salaries for teachers are not matched with similarly high salaries for principals. To recap: Leading a school is significantly harder in California than in other states, and it pays less. According to an extensive study in 2018 as part of the Getting Down to Facts II project (GDTFII), California does not have a shortage of people with the right credentials to be principals. But it does have a shortage of people who want to be principals. About half of those who earned certificates of eligibility in 2010–11 to be a principal never obtained employment as administrators. Principal turnover in schools is tremendously disruptive. It is also very common. Four years at a school is typical. According to a study in the GDTFII project, student achievement tends to fall after a principal leaves a school and it can take 5 years after a new principal is hired to fully rebound, particularly in high-poverty, low-achieving schools. District superintendents tend to remain in a district for only a few years. In the time they have, one of their most powerful tools for change is to hire the best principals they can, increasingly by "poaching" promising leadership talent from other districts. According to the GDTFII study, "Principals have become more mobile in the last decade. In 2004–05, the typical California principal had been the principal at their current school for almost 10 years, compared to only 4 years in 2016–17." Poaching makes sense as a hiring strategy, but of course it's a zero-sum game. It contributes to the churn in the system and tends to put less-well-off districts at a disadvantage. Schools with the greatest need tend to get less-experienced principals, and also tend to have relatively high principal turnover. It doesn't help that, according to the GDTFII report, principals of high-poverty and low-achieving schools report lower salaries than principals of other schools. There is ample evidence that effective school leadership really matters, and that training programs can be effective. Unfortunately, it is difficult for school districts to develop a "pipeline" of leadership talent. In 2018 the GDTFII study recommended that the state and districts should address this problem by developing principal leadership programs of "service scholarships and residency programs for school leaders," taking inspiration from programs in Tennessee and Chicago as well as from the California-based Aspiring Principals program. Because leadership plays such a strong role in school success or failure, some nonprofit organizations focus on leadership development and placement, often recruiting principals from unconventional pools of talent. The Broad Residency emphasizes recruitment and training of school district leadership. New Leaders recruits and trains teacher leaders and principals. Both organizations, in turn, recruit extensively from Teach for America. These organizations (and many others) have developed thoughtful approaches to selecting and developing school leaders. The GTDFII studies emphasize that investing in ongoing professional learning for educational leaders can have a significant effect for comparatively little cost: "One effective professional learning program estimated that the $4,000-per-candidate cost of the program equated to approximately $117 per additional student achieving proficiency." If your school is looking to hire a new principal and you have been included in the search process, GreatSchools offers a list of interview questions to ask. The toughest type of questions, and sometimes most revealing, are simulation interviews in which you ask a candidate to play-act how they would handle a difficult leadership scenario. While the most important elements of a work environment are human factors such as leadership, the more mundane physical considerations can also make a difference. The next lesson will explore these considerations. Updated May 2018, October 2018. Leadership is critical for a school's success. Which ONE of the following statements is True? California schools are "administration-light," with fewer people working in the office than schools in other states. Principals tend to earn more than teachers in all states, but the salary premium for principals in California schools is especially large. Principals tend to stay in their job until retirement, especially in California. Could I add to the discussion about movement of principals. In our school district, a good principal was often plucked to go to one of the other elementary schools which was having trouble. This might have been good for the troubled school (not always clear) but it was lousy for the school that lost the principal--no continuity with the parents, teachers, PTA etc and a sense even for the students of disruption. They are far more aware of that kind of turnover than we give them credit for, I believe. So sometimes it isn't exactly poaching, but rather the superintendent moving employees around within, but still to the detriment (especially if there was no one in house to promote to principal and the hiring was from outside and in our case too late in the year for good hires). Hi Susannah, thanks for commenting. I have been lucky enough to have known several outstanding principals in California and...a few other kind. Several years ago, I had the experience of moving my children to a well-regarded magnet school right AFTER the phenomenal principal was moved. Everything that people raved about changed (and not for the better!) within the course of just a few months. That was my second experience confirming that school leadership absolutely matters. This can be a tough pill to swallow when these decisions occur at the district level. The good news is now when I recognize great leadership, I am especially grateful for all their hard work and let them know regularly. Our school district suffered terribly from superintendent turnover--it really began to feel as if we were stepping stones to another position elsewhere. The principal situation was somewhat similar, and because of the pink slip timing, our district was always looking to hire when anyone decent (to be honest) was long since taken. That meant choosing from the dregs. In 2018 the Wallace Foundation invested in research about the role and effectiveness of "Principal Supervisors" -- a strategy for providing support and oversight to school leaders in very large districts. The research found patterns of success with this strategy. Notably: focus the job on instructional leadership, keep the span of responsibility to supporting no more than a dozen schools, and invest focus in supporting them in their role as instructional leaders. What is the average time principals stay in their role? Is there a significant difference between elementary and secondary principals time in their position? It appears that principal turnover averages about four years (now indicated in the lesson, with a link). Frankly I'm not that impressed with the data source. Each school has a leadership history, but I haven't found a way to find and assemble that data from detail. This feels like fertile ground for public records research. 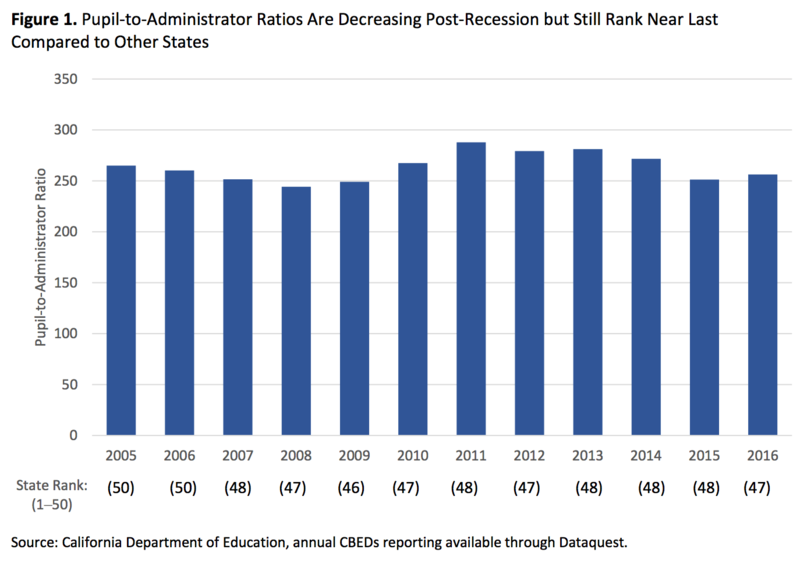 Turnover of district superintendents in big districts averages about six years according to a study by the Broad Center. This is less churn than I imagined, living in the Bay Area. cult-to-lead schools for less demanding leadership roles that serve more affluent populations." It calls for decision makers to value and prioritize principal retention efforts as much as principal pipeline development and offers a series of specific recommendations.